Average Height	: 22" - 25"
Originally called "St John's Dogs," this breed hails from Newfoundland, Canada as far back as the 1700’s and today has become the #1 most popular breed in the United States. Labs worked side by side with fishermen catching fish that came loose from the lines and trained to jump into the icy waters to help pull in the nets as well. Labradors were were brought to England in the 1800s by English ships coming from Labrador. The breed was crossed bred with setters, spaniels and other types of retrievers to improve their instincts to hunt. The second Earl of Malmesbury was one of the first to acquire the then called ‘St. John's’ dogs shipped to England sometime around 1830. The 3rd Earl of Malmesbury referred to the dogs as Labradors ~ and the name ‘stuck’. The Labrador is super intelligent and responsive therefore highly trainable and excels in hunting, tracking, retrieving, as a watchdog, proven to excel in police work ~ specifically narcotics detection. They are the #1 choice as a guide dog for the blind; service dog for the disabled; a talented choice for search and rescue, even sledding, carting, agility, field trial competitions and competitive obedience. 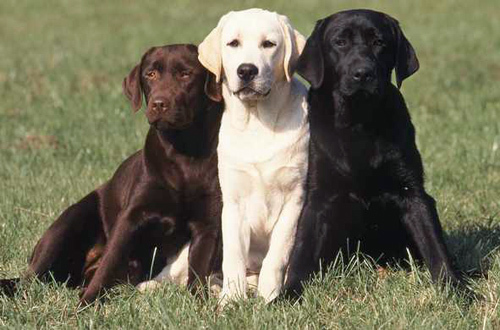 Amazingly, Labrador Retrievers almost extinct by the 1880s, and the Malmesbury family and other English fans are credited with saving the breed. Back in Canada, Newfoundland in particular, the breed disappeared because of government restrictions and tax laws. Families were allowed to keep only one dog, and owning a female was highly taxed, so girl puppies were culled from litters. •	Labradors are the #1 most popular Breed of dog. •	Love to eat, and eat some more ~ so need to be exercised and given regular meals that restrict weight gain and obesity. •	This breed has high-energy and love to work and be mentally & physically challenged. •	Winning personality, eager to please. •	Loving, great with children, a super family dog. •	Prone to hip & elbow dysplasia; cataracts; bloat ~ gastric dilation and ear infections. •	Easy to bathe and groom. Their coat ‘wicks’ off dirt easily. The Labrador Retriever is a very active, excitable dog, bred for hunting and swimming and overall energy. This can make it an excellent family pet, and largely accounts for the breed's popularity--but it can also make the breed into a handful and a real challenge for inexperienced dog owners who don't know how to train and handle large, active dogs like the Lab. Although Labs are wonderful dogs once their owners understand how to deal with them, they can be the worst nightmare of people who think that a few pats on the head, a walk now and then, and lots of treats to keep the peace are a viable strategy for owning a dog of this breed. Labs are extremely friendly. This can be a very good thing--it's easy to introduce your Lab to a new person without lots of barking or aggressive behavior--or a very bad thing--since the eighty-pound Lab will often express his or her friendliness by jumping on that same new person, sometimes even knocking them down. Although Labs are highly intelligent, they often get a reputation for being fools of the canine world due to their over exuberance and even hyperactivity. Labs also remain mentally immature for the first three years of their life, exacerbating the problem of their overfriendliness considerably. Careful training can get these intelligent dogs to think twice about their actions, however, and can make them "safe for company." Labs also do fairly well with children, but you should be careful when allowing children to play with a Labrador Retriever--although the dogs would never knowingly do harm to any member of their "family", they can sometimes knock down and unintentionally harm a smaller child. As a rule, you shouldn't let children play with Labrador Retrievers without supervision until the dog's training is complete and the dog is well out of its puppy years. Anyone who tries to use the Lab as a guard dog will likely be disappointed: although Labs can be moderate barkers in some situations, the breed is far too friendly and far too non-agressive to be effective at patrolling a property or running off strangers. Labs' habit of barking can make them good watchdogs in some situations, but often at the cost of good socialization with family members. Although generally healthy, Labrador Retrievers are still prone to the same hip and joint problems that plague most large dogs hip dysplasia and elbow dysplasia. They can be prone to a few eye disorders as well as Progressive Retinal Atrophy being the most serious. They also have large appetites and a tendency toward obesity which needs to be carefully checked by owners in order to keep the Lab generally healthy. The Labrador Retriever's waterproof coat is designed to self-clean in several important ways, which minimizes your responsibility for grooming to some extent. But without a regular schedule of grooming in some important areas, the overall health of your dog can decline, so the Lab's miraculous coat can't simply be left to do its work in isolation. The Lab's hard outer coat and undercoat should be brushed about once a week in order to remove any dead hair and to alleviate shedding. Labs can be bathed on occasion without problems, although shampoo should be used lightly in order to avoid damaging the waterproofing on the Lab's outer coat. Often a simple dip in a nearby pool or river can do the trick for cleaning off a Lab, assuming that you don't mind the "wet dog" smell that swimming causes. The Lab's ears should be checked on a regular basis for signs of parasites or infections. Drop-eared dogs are at a high risk for this kind of ear injury and damage, and regular cleaning and inspection of the Lab's ears can help with prevention (which, as the adage goes, is worth a pound of any cure.) The Lab's hard coat and active lifestyle can also cause small bits of dirt, leaves, or even parasites to get caught close to to the dog's skin, causing heavy irritation. Regular brushing and occasional baths will take care of most of this, but a quick inspection of the Lab's body from time to time can help you to know when the best time for a brushing or bathing is, and can help to find and remove parasites before they become health problems for the dog. Labrador Retrievers are very excitable and will require a great deal of exercise, especially during the first three years of their lives. At a bare minimum, you should expect to take your dog for about two walks a day. Make sure to use a strong leash, as Labs have very powerful neck and shoulder muscles and can easily pull you off balance if you aren't careful. Beyond these walks, however, you'll need to give your Labrador some room to get out all of the exercise he or she needs. A yard is the best for this kind of activity, and a fenced yard is vital to keep your dog from wandering off or chasing strangers or other animals--remember, the Lab was bred for hunting and retrieval. Since Labs are powerful jumpers, you need to make sure that you have an adequate fence in place in order to keep your Lab from escaping. Four feet of fencing will stop all but the most dedicated of jumpers, while six feet will be an impassible barrier to any Lab. Your dog isn't likely to try escaping unless he or she is otherwise bored or unhappy--which shouldn't be the case--but if any escape attempts do occur, you'll need to be ready for them. Labs are also natural and enthusiastic swimmers. If you have access to any kind of water--rivers, beaches, lakes, swimming pools, or even ponds--you should make a point of using these as ideal exercise venues for your Lab. Although all Labs naturally excel at swimming, younger Labs may need some time to get used to the water, and all Labs should be introduced to the water only near natural "steps" or other shallow regions--this ensures that the dog will know how to get out of the water whenever he or she starts to tire, or whenever he or she simply gets bored with swimming for the day. Under no circumstances allow your Lab to simply jump into deep water and hope for the best--even the best swimmers can't keep afloat if they don't know how to get out of the water when they need to. If you're worried about the exuberance or activity of your dog, remember this and be comforted: Labrador Retrievers are quick to mature physically, but slow to mature mentally. Until sometime in their third year, your Lab will likely have the mind of a puppy but the body of an adult dog--a condition which leads to some very exuberant, sometimes difficult to control exercise. This is not a problem that will last throughout the dog's life, and any Lab will naturally become much calmer with advancing age. The Labrador Retriever is an extremely excitable dog, known for its propensity for swimming, pulling on leashes, and jumping on friends and family members to show its excitement. This kind of behavior is normal for many dogs, but for the Labrador Retriever--which usually weighs at least sixty pounds, and often much more--it can be a serious problem. Rudeness is one worry, of course--no family member wants to be jumped on by a wet eighty-pound dog if they can help it--but over-excited and under-trained Labs can also knock down and injure children or smaller adults, and it's simply a hassle to deal with as a Lab owner. So training for your Lab should start as early as possible. At about six months, Labs are fully-grown (physically, at least--mentally, Labs require about three years to fully develop), and training at this point becomes much more difficult simply due to the dog's large size. So introducing simple commands ("sit" and "heel" in particular) should be done before that six-month threshold in order to make later training much more manageable, and to discourage jumping and other rude behavior to some extent. Positive rewards for good behavior should also be verbal rewards or rewards of affection--soothing voices, pettings, and other similar rewards--as opposed to food rewards. Labs have a tendency toward overeating, and offering food rewards for good behavior can contribute heavily to this problem if not moderated closely. If you do need to offer your Lab a special dog treat or other food-based reward for a particularly impressive feat of obedience, then make sure to adjust the Lab's diet accordingly in order to maintain good health in the long term--far more important, one could argue, than good behavior.